Reasons to switch to Cast Iron Pans! It’s green: They last a lifetime so the production of them is less, helping with waste. There is nothing toxic in them, even the pre-seasoned pans are coated with vegetable oil which is fine for the environment! And not to mention they are 100% recyclable. 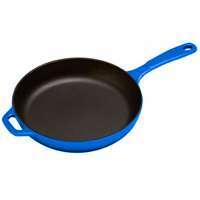 It’s healthy: There is a lot of controversy surrounding Teflon and non-stick pans (if you’re interested in finding out more about this topic simply Google it.) Cast Iron pans emit iron into our food which is a mineral we all need. I became a vegetarian back in January and it was quite the adjustment for me considering I was as carnivorous as they came. I have always loved to cook but when I became a vegetarian I literally had to re-teach myself how to do so. My meals use to consist of meat, starch and veggies, it was really quite a challenge to come up with hearty meals that didn’t just feel like a bunch of side dishes. But I must say roughly 7 months in I think I am finally starting to get the hang of it. Another really big adjustment in my new diet was making my boyfriend happy. Just because I don’t eat meat anymore doesn’t mean I want him to go hungry. I have always offered to cook meat for him in addition to whatever I am cooking but to my surprise he always declines. The trick is to use ingredients that really satisfy your hunger. I am a big believer in getting your grains and greens every single day it will really do wonders for your digestive system and overall health. Anyways here is a recipe I found on Vegweb.com however, being that I am not vegan and my boyfriend HATES mushrooms (I think it’s a guy thing?) I altered it a bit. Cook potatoes in boiling water. Mash cooked potatoes with as much milk as you need and lots of buttery spread to make them nice and creamy. Add some salt and pepper and a sprinkle of garlic powder. Heat the oil in a large pan and sauté the garlic and onion over medium heat until soft and translucent. Add the broccoli, carrots, corn, black beans and celery and cook until veggies start to wilt. Preheat oven to 375 degrees F.
Add the broth and 3/4 cup milk along with the cornstarch and flour. Let the mixture come to a boil, stirring frequently. Sauce will thicken up a bit. Season with salt and pepper if you need to. When all the vegetables are cooked, remove from heat. Spray an 8″x8″ baking dish with nonstick oil spray or wipe with e.v.o.o., spread half the potatoes on the bottom of the dish and spoon the vegetable mixture onto the bottom and then cover with the potatoes and smooth them down. 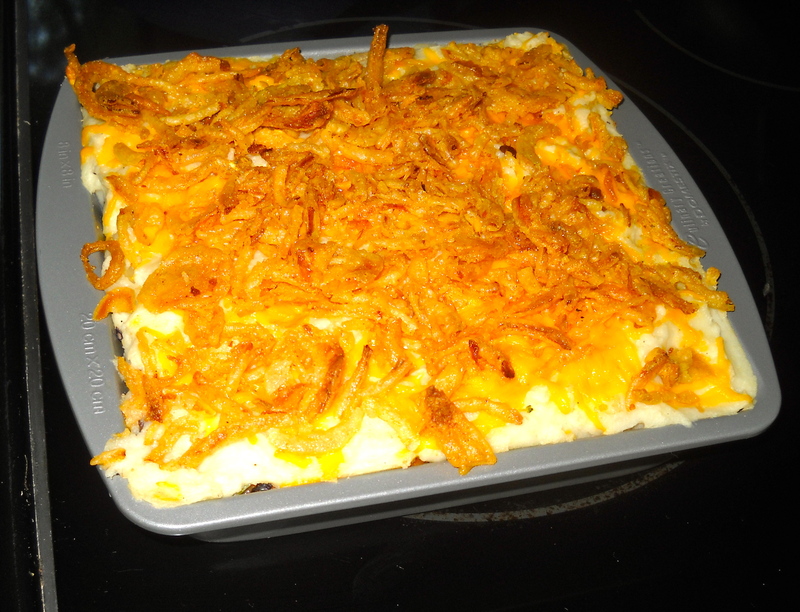 Sprinkle the top with nutritional yeast, cheddar cheese and French fried onions. Heat in oven for 10 minutes or so until top is slightly firm and onions are browned. Drink with a delicious pale ale!